NOTE: The post stitches used in this pattern are Shallow Post Stitches (tutorial HERE) – but some prefer standard post stitches! So give each a try and see which you like best. Round 12: Ch 2. Fpdc in the first st, bpdc in the next st. *Fpdc in the next st, bpdc in the next st. Repeat from * to end, break yarn and seamless join. (52(62) sts) Weave in all ends and stay warm! And voila, your ears are all warmed up! 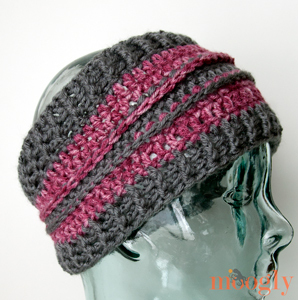 This ear warmer is narrow in the back for easy wearing, and wide up front to keep you as warm as possible. I hope you enjoy making it – I can’t wait to see your photos! Love this! I think I will have to make a couple!! 😀 Thanks so much Elena! I cannot print this without having advertisements blocking the instruction. Have tried several different times. Hello Bonita! Have you tried the green Print Friendly button at the bottom of the post? I love it! I made one and wore it for awhile today. I love how it fits! Then I had to take it off because I was way too warm with it on. I was surprised how warm it kept me. Almost makes me wish for colder weather so I can wear it some more. 😀 Thank you so much, Tamara! 😀 What a great review! Thanks so much Julia! Fun! I loved making it. I also learned techniques I did not know!! I have been crocheting for 60 years and today I learned how to to a Foundation double crochet and a seamless join. I will make several more for family. Thank you so much for the pattern. What a good reason to grow my hair!! 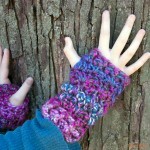 !I will make 2 for gifts..thanks for the beautiful patterns!!! 🙂 have a great day! What a fun project! I am also in my 60’s and learned three new techniques in this great pattern. Thank you, Tamara. Your videos are awesome too! This is all grown up! I’ve been meaning to make something like this. This seems a good place to start. I love the color choices, very adult without being dull. Thanks for sharing, Tamara! Do you HAVE to do the foundation double crochet or could you make a regular chain and a row of double crochet and then join? Thanks for answering! I made this in one sitting and i LOVE it!! can’t wait to wear it to work tomorrow! YAY! 😀 So glad to hear it!! Pinterest link goes to google+. I would like to try this. I think my daughter would love it. it was hard at first to find the V for the second stitch. 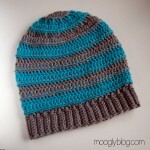 but now i got it all figured out and it’s just flying =) thanks for the great pattern! 😀 Thanks! Glad you stuck with it! I absolutely love this pattern! I started and finished in two hours. I will get few made this weekend! Thank you all the work you do! Peace always! 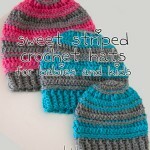 I am trying to make this but as I am a tight crocheter (sp?) I would like to know about how many inches that is; and do I scale up the rest of the sc’s and hdc’s or keep them the same and just up the dc’s? After 40 some years I learned how to do a foundation double crochet,never had done before,directions were very clear. Ty and I also had a refresher in BP and fp stiches, love the earwarmer. It’s for almost 17th old grandaughter, will make a few more ty again! 😀 Thank you Ruth, I’m so glad you liked it! I am confuse on how to get the 52 fdc started. Do I chain 52 and then go back and do the stitches. I did it like the one in the video but that was only with 3 chains. When I tried to chain 52 and go back some how I ended up with a backwards circle and I didn’t even slip stitch together. So glad I found this pattern! A friends mom asked me to make her one & then obs of her moms friends asked. I didn’t really have a pattern to go by so I was just going to do it myself, but this is awesome! she was looking for a translation of the model into french. Yes, unfortunately I haven’t had a French translator volunteer to do this one. Love this. Did it as a test piece and learn different stitches piece, daughter posted a picture and just got a request for six more by her friends. Thanks for making me busy. 😀 That’s fantastic Shannon, thank you! Thank you for such a well written pattern! I am new to crocheting and not good with patterns but this was easy to follow and it turned out beautiful! Thank you again! Do you count the first ch 3 as a dc? Love this pattern! Just made one in local school colors 🙂 Works up quickly. Thanks for the pattern! Oh yay! 😀 Thank you Sil! Thanks for the pattern. I have started making this headband tonight. I have a question…….. making the Large size, 62. Row 1 says….Without twisting, join to first FDC with a sl st. I don’t get the part of slip stitch. It seems to not connect all the way to the bottom of the FDC? 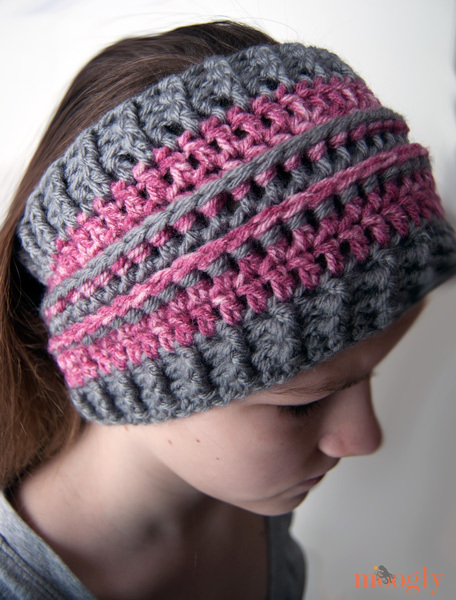 Is there a tutorial on connecting first row to second row when making head bands? Thanks and looking forward for your response. Tamara, I re-read the very beginning of your post and pattern. Sorry, I didn’t notice that you sent a link on joining foundation stitching in the round. Missed it completely when I started this headband. I did think of another question…..Row 1, says to join 62….do I count the very first ch 3 as one post and as as the 62? Or just count the FDC only? I love your stuff! I have been to your site many times. I begun the fairytale poncho, (didn’t say I finished it yet) I am doing it in 2 colors, green and cream and a #5 yarn and it is so soft. I just finished hand copying the instructions for your earwarmer and the instructions for the clouds which I will use on a blanket for my youngest grandson. You are truly talented. Thank you! I would go with whatever hook makes the first round fit comfortably around your head. I am lefty, would luv video in my direction lol. But am still trying as always with a twist lol. I’ll add it to the to-do list, thank you Lei Lani! Hi there, love the pattern! I am having a problem unfortunately. Even though I have counted my stitches to make sure I have 62, when I get to the end of my first round of fpdc and bpdc I end up with no other option but to make my last stitch around my chain 2. I can’t for the life of me figure out what I’m doing wrong! Any help or ideas would be greatly appreciated! It’s impossible for me to say without being there – but working it around the ch 2 is a good solution otherwise! 😀 Thank you so much Renee! I’m so glad to hear it!! I tried the “Print Friendly” button at the bottom of the page and the ads still block the pattern. Any help? Hi Angela! You can use PrintFriendly.com in another tab. I don’t know why the ads showed up for you, but you can also click on them to take them off the Print Friendly page before printing. You can also copy and paste the pattern to word, or even highlight and right click print. 🙂 I don’t have any of those standard options blocked. Yay for Printfriendly.com!! Thanks for the tip =) Anxious to start making this one and try your short post stitches! Great pattern but my color joins are ugly. Any advice how to eliminate the color jog? I am really looking forward to trying this. My question though, is can I just use one wool. I have a lush wool that is already multi coloured. Can I miss the section about joining second colour or adapt it somehow please? One more question if I may please. I promised I won’t keep bugging you. At the end of each round do I turn so I am working Right Side and Wrong Side or just keep going? I answered my own question because I have just watched your full ear warmer tutorial. Thank you so much for such awesome easy to follow explanations. 😀 I’m so glad the video helped! Thank you Sarah! We just moved to the snow and this is the perfect ear warmer for going for a walk, hike, run, bike or just going out of the house, thank you. I made one while the family watched tv, they all looked up and smiled at my new warm and cozy ear warmer, They’ll all get one too. 😀 How wonderful! Thank you so much! ♥ Stay warm! I’d love to make something like this for my granddaughter. Would the small size in this be small enough for a 3 yr old? Or maybe you could suggest something else! Love all your tutorials! So easy to follow!